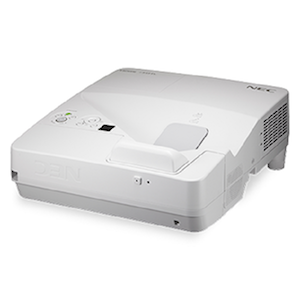 NEC Display Solutions of America has launched a new ultra-short-throw projector will allow users to make annotations on the image projected onto any wall, dry erase board or chalkboard without the need of a computer. The company's UM352W is designed to provide greater collaboration between students and teachers. The 3,500-lumen projector includes two interactive pens and a built-in interactive pen receiver that can be used on just about any surface. Although it can be used without a computer, it does work with NEC's NPO1TM touch module, allowing finger-touch white-boarding and interactivity with a connected computer. It includes an app that lets teachers and students present, share and annotate content from a large variety of devices, including PCs, tablets and smartphones. A wide set of inputs. The UM352W with built-in pen-based interactivity, stand-alone white-boarding and DisplayNote software is available at a suggested retail price of $2,349. Bundled with a custom wall mount, the suggested retail price is $2,449, and with the custom wall mount and interactive touch module $2,748. "Educators continually tell us the importance of collaboration with students in the classroom," said NEC Display Solutions Senior Product Manager Bob Guentner. "The UM352W projector helps them fulfill that mission."